We are offering a wide range of UT Stirrer which is customized as per the specifications of our clients. These possess blades for mixing of liquid syrups, and paste type substances with blades which can later on b easily taken out of the bottle. - Fitted with Electric motor having maximum speed up to 4000 R.P.M approx. - Fitted with chrome plated Road on a Heavy Cast Iron Base. 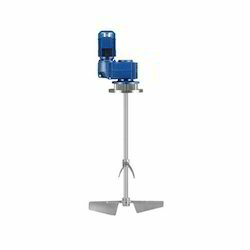 - The height and angle direction of the Stirrer can be adjusted according to the requirement. - Stainless steel Stirrer Rod fitted with motor to give smooth funtion. - Supplied with speed Regulator. - Electronic Speed Regulator. Speed of Motor can be regulated for 0 - 100%. - Maximum Mixing Capacity 60 Ltrs. - Available in SS 316 / 304 Construction. We feel immensely pleased to manufacture and supply an exclusive gamut of Laboratory Stirrers. - It is used for the motion of the fluid. Made of Polypropylene, these Stirrers are very useful for stirring different solutions in the laboratory. These Stirrers prove to be tough and long lasting. Universal tupe 1/20 H.P. 4000RPM continuously variable speed facilitating the agitation of liquids. 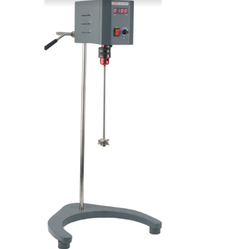 The motor stirrer having maximum speed up to 4000 RPM. Unit is clamped to C.P. rod fitted on a heavy cast iron base. The height and angle of the stirrer can be adjusted according to the requirement. Variable speed motor with 1/20 HP. Regulator is fitted with S.S. stirrer rod to give smooth and noiseless operation. With the support of professionals, we have been proficient to provide our valued patrons the best quality range of Laboratory Stirrer. Glass plants are normally supported in a tubular structre formed of galvanised steel tubes. This type of structure is proved robust and flexible over many years.